Posted on March 1, 2014	by Katy K.
Congratulations to Kim, the winner of my tenth anniversary giveaway, and thanks to everyone who entered! I loved Seven Against Mars last year, so of course when Mr. Berman-Gorvine offered to send me a copy of his latest book, I was happy to accept. 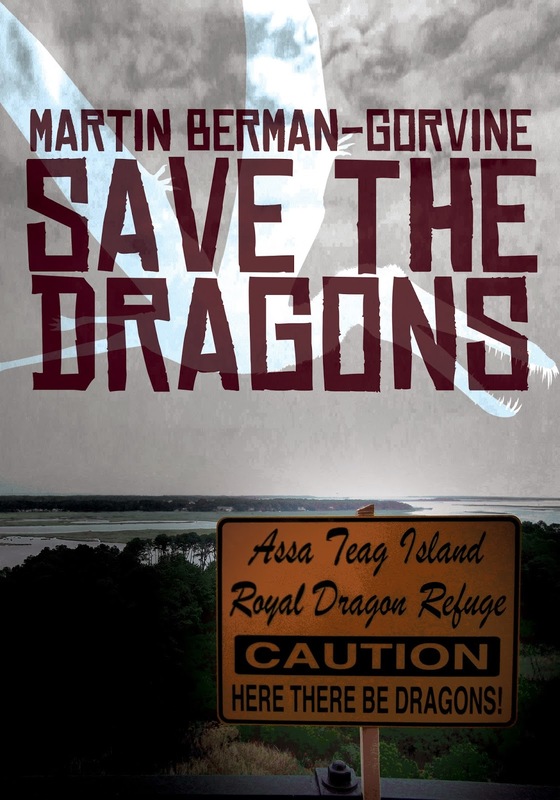 Save the Dragons by Martin Berman-Gorvine. Wildside Books, 2013. Teresa is wandering around the streets of Philadelphia with a bad case of the teen blues, when she stumbles across Gloria’s Gateway Books. Inside is the most wonderful used book and record store imaginable, filled with books and records that shouldn’t exist. A steaming cup of hot chocolate, a note addressed to her, and a friendly cat are waiting on the counter for her. After a few visits, she starts leaving notes not just for the owner, but for a boy she finds has been visiting, too. Actually meeting the boy turns out to be more difficult than either of them imagined, though – Tom lives in a Philadelphia that’s still part of Britain, where England itself has been part of the Napoleonic Empire for a couple of centuries. They are going to have to learn more about the magic of Gloria’s Gateway Books to be able to meet in person. When they do, Gloria herself tells them that they haven’t been brought together just because they’re kindred spirits – the precious dragon that Tom’s father studies is in grave danger, and Tom and Teresa must save it. Exciting adventures across continents, traveling by train and airship ensue, and both teens gain enough self-awareness to feel less bleak about their normal life circumstances. The violence is low and romance is mild, but with lots of kissing. For that reason, I’d say that kids young enough to find romance icky wouldn’t enjoy this, but that it’s otherwise appropriate for middle school and up. There was a lot about this book that I loved and a few things that didn’t quite work for me. I loved, loved, loved Gloria’s Gateway Books, both a portal between worlds and a repository for rare books and music from multiple dimensions. I enjoyed the alternate history of Tom’s dimension, the natural history of dragons in it, and the interplay between Teresa and Tom as they negotiated between Teresa’s modern dating expectations and Tom’s old-fashioned and formal courting mores. My lonely sixteen-year-old self would have loved the idea of a boy in an alternate dimension who was perfect for me, and I don’t think that an inter-dimensional matchmaker would have bothered me, either. As an adult, though, the romance didn’t quite ring true. It felt like Tom and Teresa were pushed into a romantic relationship, so that Teresa would help with Tom’s problems, when she could have helped just as well out of pure friendship and a sense of adventure. And on the topic of adventure, while it was fun, there was a lot of circuitous travel that wasn’t necessary to solve the problem at hand, and a little too much reliance on adults for a purely satisfying teen adventure. I’m guessing that only that last might bother the target audience. Issues aside, the blend of speculation, adventure and romance made for a very entertaining read, especially recommended for fans of magical bookstores and dragons. Now I’m trying to remember other books I’ve read with magical bookstores. There’s Mr. Penumbra’s 24-Hour Bookstore, but I could swear I read a book as a young teen with a bookstore that, like this, appeared and disappeared on its own. Did anyone else read this? This entry was posted in Books and tagged alternate history, dragons, teen fantasy, time travel. Bookmark the permalink. I will get back to you soon – today was BUSY, and I have little brain left. My pleasure, and take your time!